Black Cohosh / 120 Vcaps - Nature's Way®. Black Cohosh extract standardized to 2.5% triterpene glycosides. Take 1 capsule twice daily with food or water. Caution: Do not use if pregnant or nursing. Discontinue use and consult a healthcare professional if you have a liver disorder or develop symptoms of liver trouble, such as abdominal pain, dark urine or jaundice. If taking any medications, consult a healthcare professional before use. 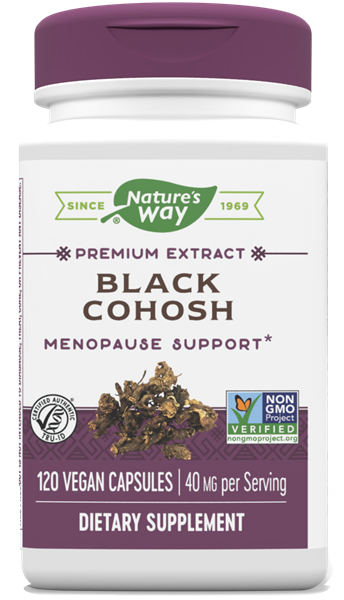 Black Cohosh is helpful during menopause.